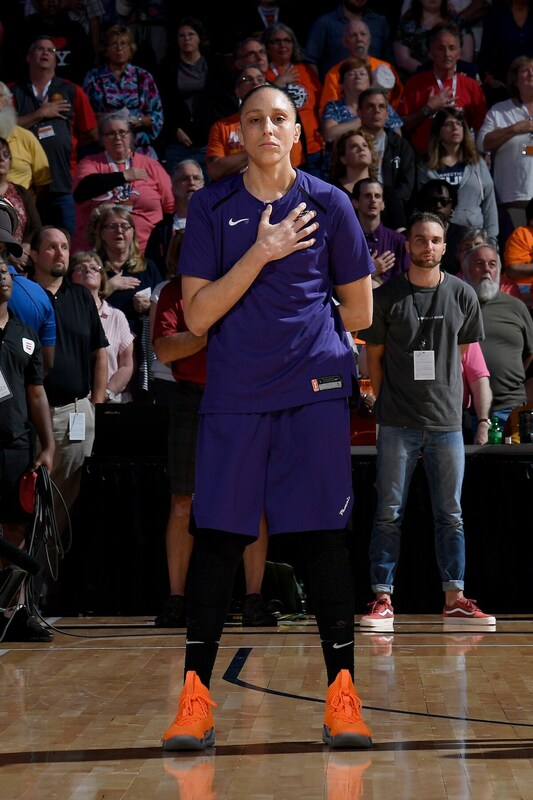 UNCASVILLE, CT - AUGUST 23: Diana Taurasi #3 of the Phoenix Mercury stands for the National Anthem before the game against the Connecticut Sun in Round Two of the 2018 WNBA Playoffs on August 23, 2018 at the Mohegan Sun Arena in Uncasville, Connecticut. 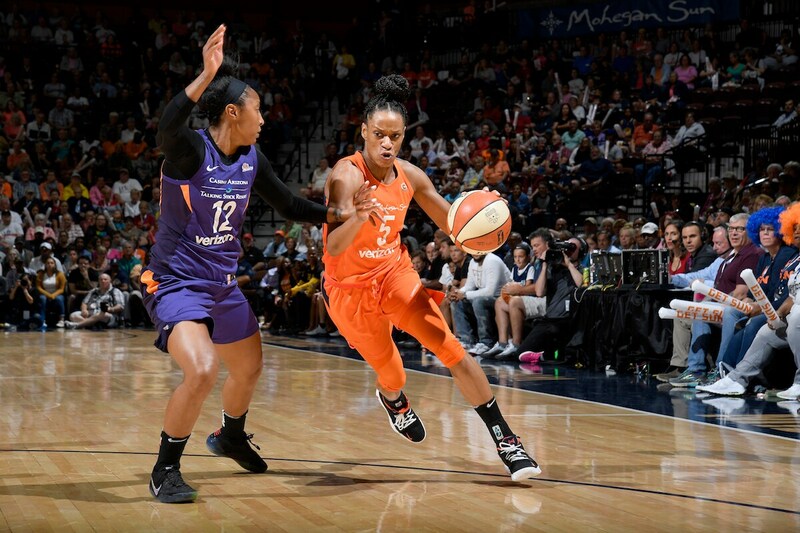 UNCASVILLE, CT - AUGUST 23: Jasmine Thomas #5 of the Connecticut Sun handles the ball against the Phoenix Mercury in Round Two of the 2018 WNBA Playoffs on August 23, 2018 at the Mohegan Sun Arena in Uncasville, Connecticut. 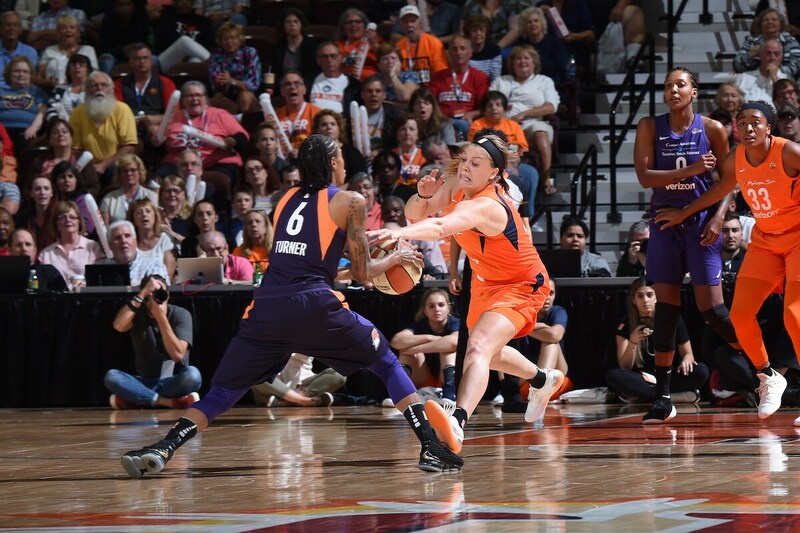 UNCASVILLE, CT - AUGUST 23: Stephanie Talbot #8 of the Phoenix Mercury handles the ball against the Connecticut Sun in Round Two of the 2018 WNBA Playoffs on August 23, 2018 at the Mohegan Sun Arena in Uncasville, Connecticut. 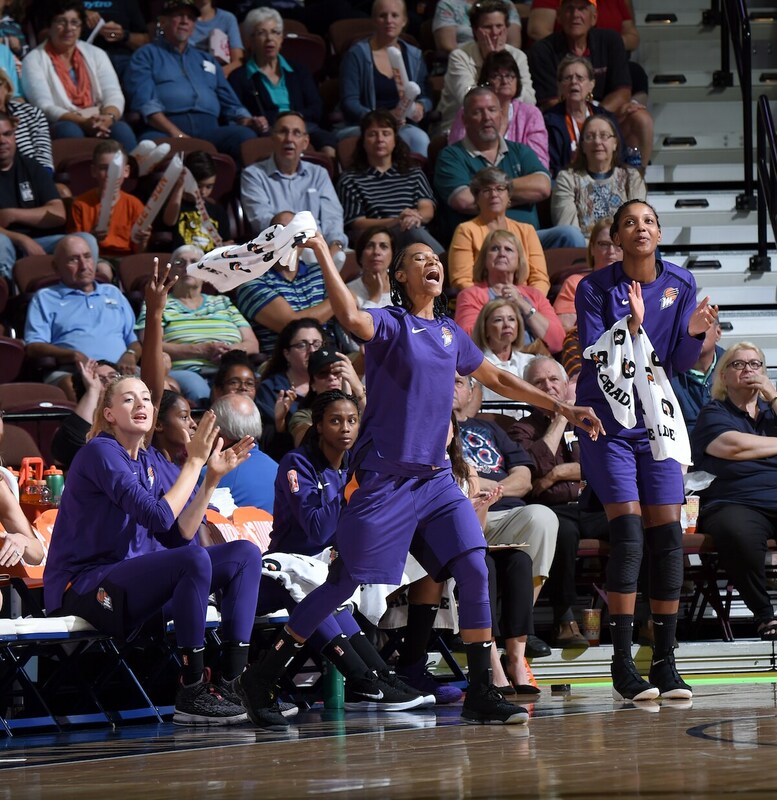 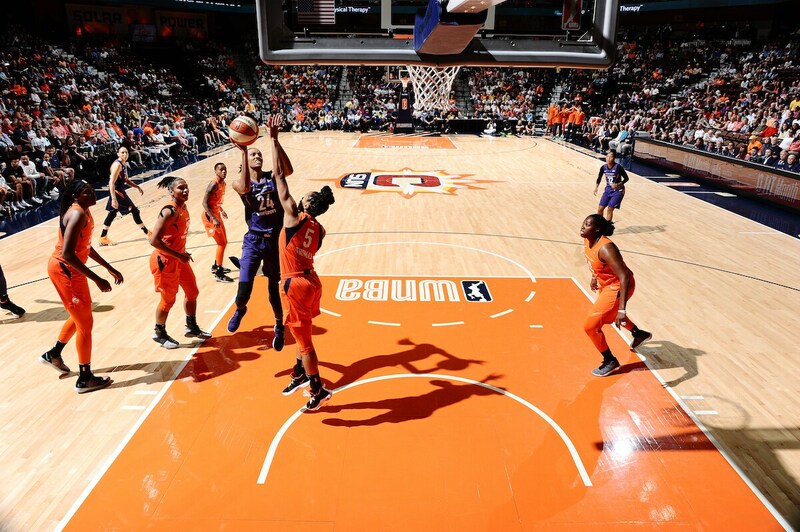 UNCASVILLE, CT - AUGUST 23: The Phoenix Mercury react during the game against the Connecticut Sun in Round Two of the 2018 WNBA Playoffs on August 23, 2018 at the Mohegan Sun Arena in Uncasville, Connecticut. 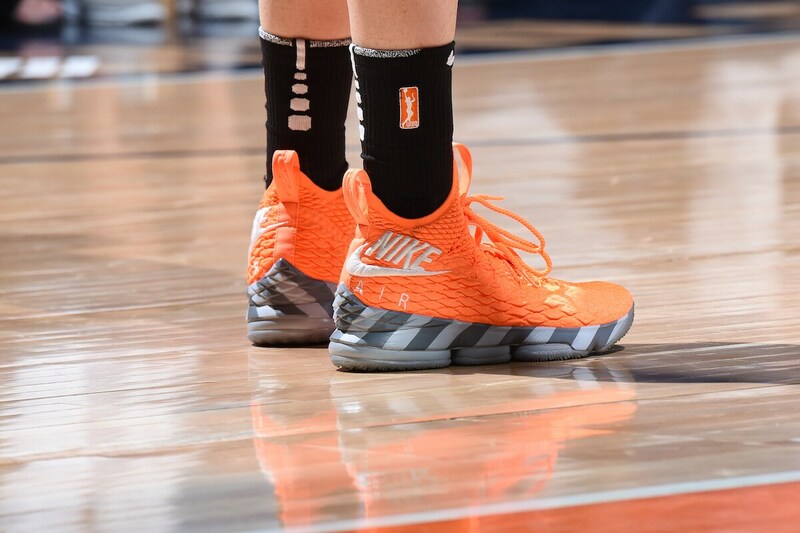 UNCASVILLE, CT - AUGUST 23: The sneakers of Diana Taurasi #3 of the Phoenix Mercury are seen during the game against the Connecticut Sun in Round Two of the 2018 WNBA Playoffs on August 23, 2018 at the Mohegan Sun Arena in Uncasville, Connecticut. 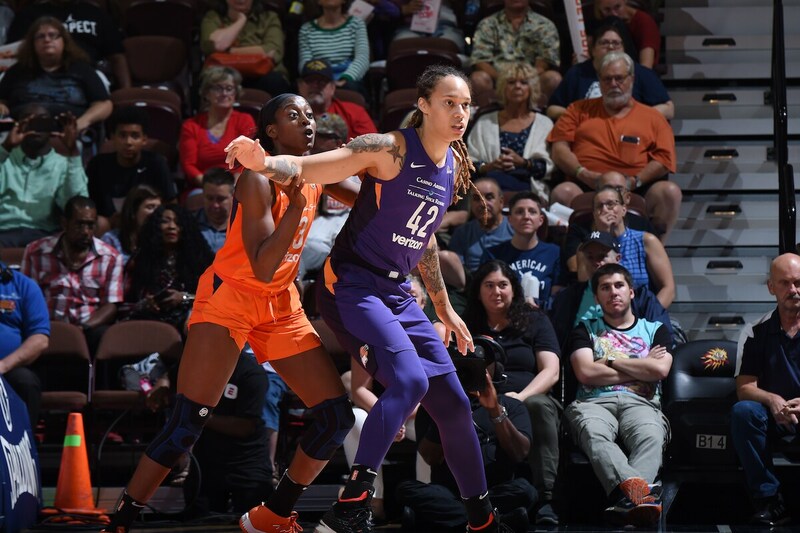 UNCASVILLE, CT - AUGUST 23: Brittney Griner #42 of the Phoenix Mercury battles for position against Chiney Ogwumike #13 of the Connecticut Sun in Round Two of the 2018 WNBA Playoffs on August 23, 2018 at the Mohegan Sun Arena in Uncasville, Connecticut. 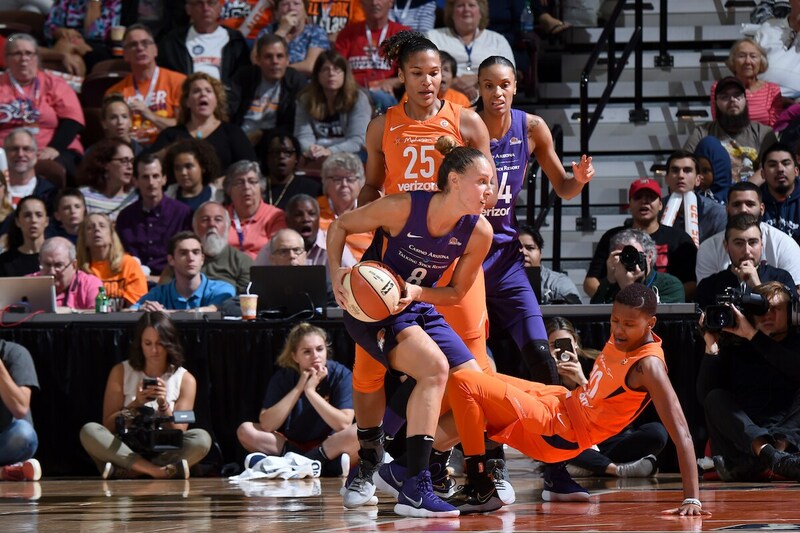 UNCASVILLE, CT - AUGUST 23: Rachel Banham #1 of the Connecticut Sun goes for the steal against the Phoenix Mercury in Round Two of the 2018 WNBA Playoffs on August 23, 2018 at the Mohegan Sun Arena in Uncasville, Connecticut. 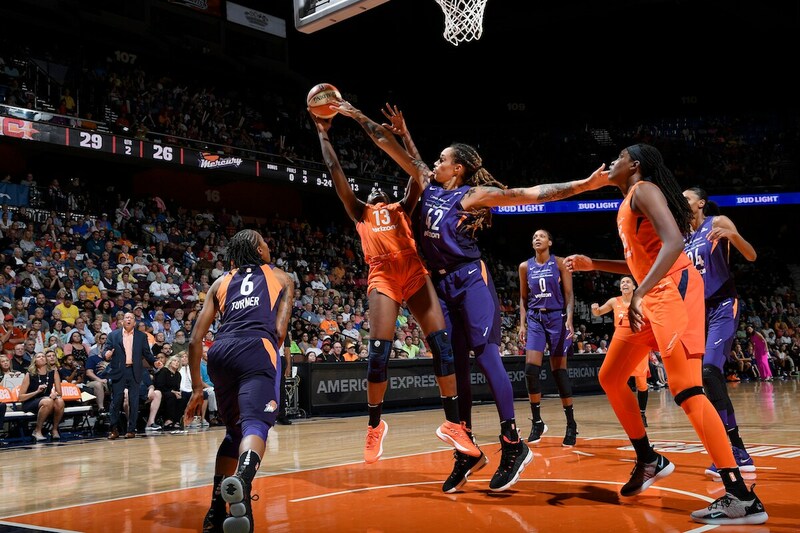 UNCASVILLE, CT - AUGUST 23: Chiney Ogwumike #13 of the Connecticut Sun goes to the basket against the Phoenix Mercury in Round Two of the 2018 WNBA Playoffs on August 23, 2018 at the Mohegan Sun Arena in Uncasville, Connecticut. 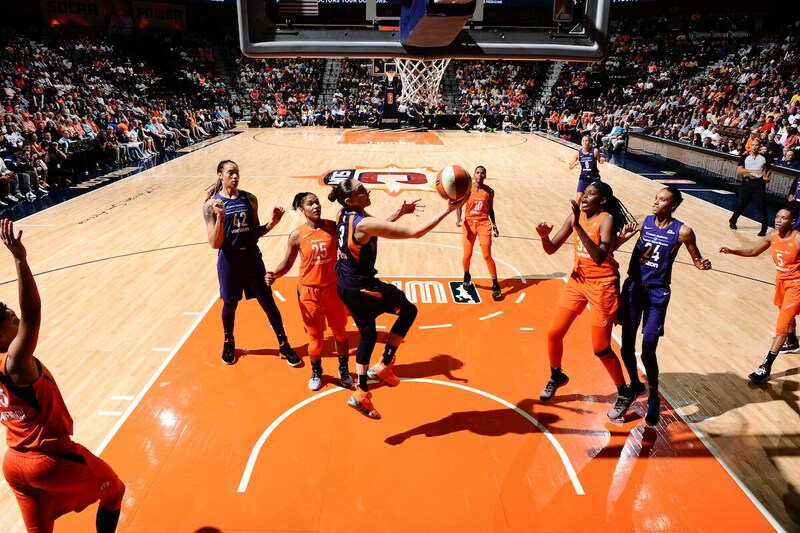 UNCASVILLE, CT - AUGUST 23: DeWanna Bonner #24 of the Phoenix Mercury shoots the ball against the Connecticut Sun in Round Two of the 2018 WNBA Playoffs on August 23, 2018 at the Mohegan Sun Arena in Uncasville, Connecticut. 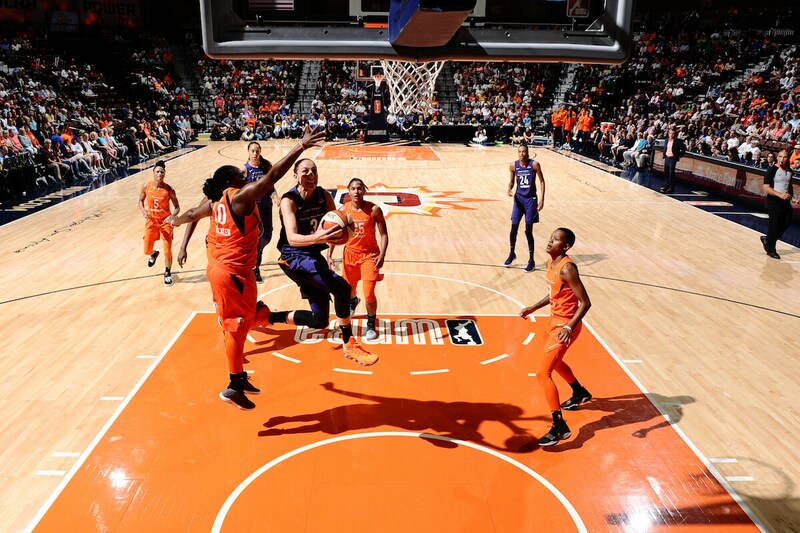 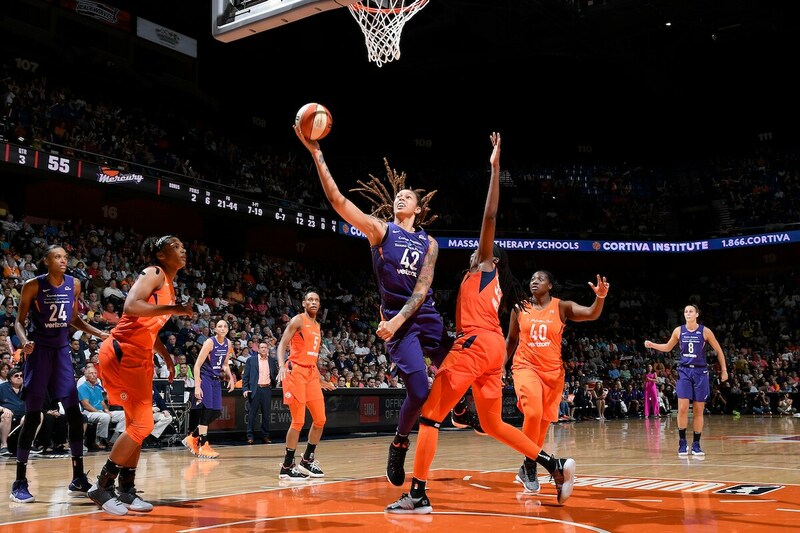 UNCASVILLE, CT - AUGUST 23: Brittney Griner #42 of the Phoenix Mercury goes to the basket against the Connecticut Sun in Round Two of the 2018 WNBA Playoffs on August 23, 2018 at the Mohegan Sun Arena in Uncasville, Connecticut. 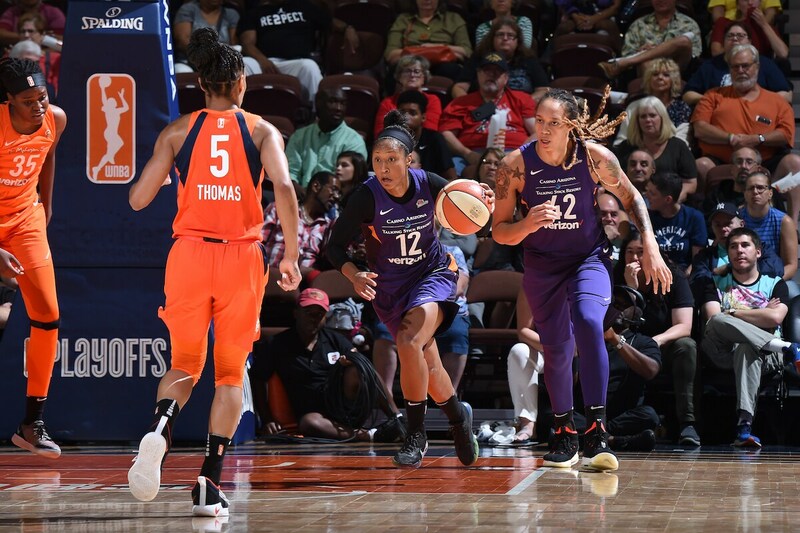 UNCASVILLE, CT - AUGUST 23: Diana Taurasi #3 of the Phoenix Mercury goes to the basket against the Connecticut Sun in Round Two of the 2018 WNBA Playoffs on August 23, 2018 at the Mohegan Sun Arena in Uncasville, Connecticut. 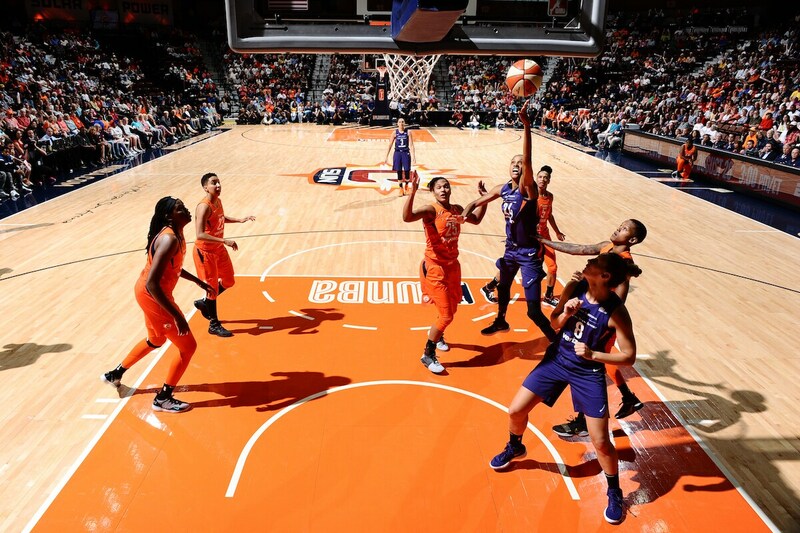 UNCASVILLE, CT - AUGUST 23: Briann January #12 of the Phoenix Mercury handles the ball against the Connecticut Sun in Round Two of the 2018 WNBA Playoffs on August 23, 2018 at the Mohegan Sun Arena in Uncasville, Connecticut. 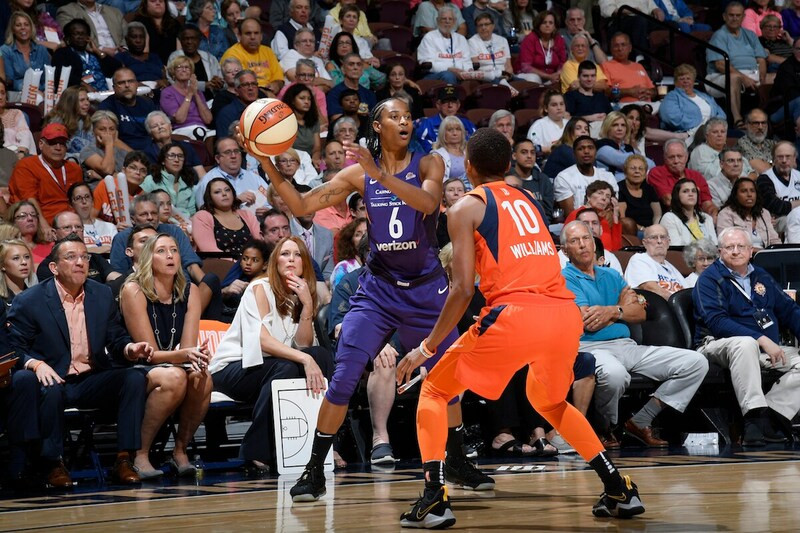 UNCASVILLE, CT - AUGUST 23: Yvonne Turner #6 of the Phoenix Mercury looks to pass against the Connecticut Sun in Round Two of the 2018 WNBA Playoffs on August 23, 2018 at the Mohegan Sun Arena in Uncasville, Connecticut. 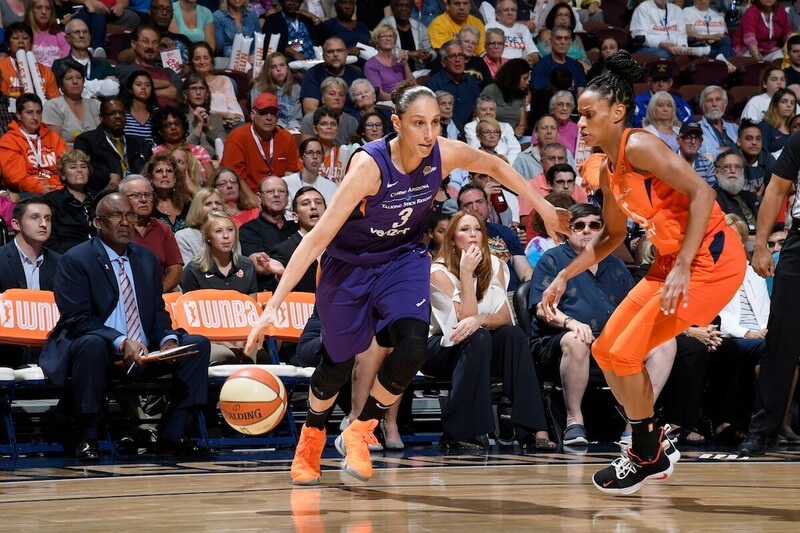 UNCASVILLE, CT - AUGUST 23: Diana Taurasi #3 of the Phoenix Mercury handles the ball against the Connecticut Sun in Round Two of the 2018 WNBA Playoffs on August 23, 2018 at the Mohegan Sun Arena in Uncasville, Connecticut.